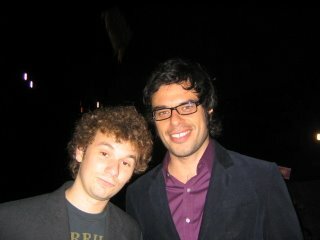 For all you fans of HBO's "Flight of the Concords," here's Max with Jemaine at last Sunday's HBO Post-Emmy Party. Bret was off mingling with the ladies and Murray was apparently still parking the car. Also new: an excellent spread about the book and my college days in the Washington University, St. Louis Alumi Magazine. http://magazine.wustl.edu/Fall07, then scroll down to article. Hats off to editor Terri Nappier, writer C.B Adams, and photographer Ron Brown for an A+ job! 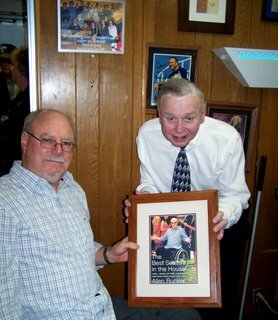 Just back from my hometown of Bartlesville, Oklahoma and the distinct honor and privilege of seeing a framed cover of "The Best Seat In The House" on the wall of fame -- right next to OU legend Barry Switzer -- at one of the finest eateries west of Le Cirque, Murphy's Original Steakhouse. That's owner Paul Murphy, high school classmate of mine, next to me in the pic. I brought 13 in-laws -- including five squirmers -- to dinner with me and Paul treated the whole clan. If you're in the area, do yourself a favor and drop by Murphy's. Order the hot hamburger with gravy over all. You won't be disappointed.